What does ergonomics really mean? Ergonomics is the science of designing the workplace to suit the capabilities or limitations of the worker. A workplace committed to ergonomic design and tailored workspaces will reap greater rewards – reduced costs, improved productivity, greater quality, increased employee engagement and a better safety culture. The average office worker spends about 80% of their day sitting – so good posture, back care and ergonomic seating is vital to ensure health and wellbeing, as well as reduce the risk of back and neck pain, headaches and problems with legs and feet. The Back Centre team are the ergonomics experts. At Back Centre, we talk about your health first. We have spent more than 30 years helping our customers adapt workplaces to suit individuals. In store, our team will spend as long as they need to discover a person’s exact needs. On-site, our experienced occupational therapist, Judy Ross, provides individual and group ergonomic assessments. Why should I book an Ergonomic Assessment? A session with Back Centre’s own occupational therapist, Judy Ross, will change the way you work. Judy has more than 25 years’ experience in office ergonomics and seating and injury management. Judy conducts comprehensive on-site assessments of chairs and seating and workstations, analysing factors that may cause or aggravate any problems. Injury management can be costly – the earlier problems are addressed, the better. When employees are experiencing musculoskeletal problems, an ergonomic workstation assessment can make a huge difference to their recovery. This service will ensure that the workstation and chair are adjusted for correct ergonomics. It is ideal for anyone who is unsure about the suitability of their workstation equipment and arrangement. It is not recommended for anyone who is experiencing health or musculoskeletal issues. Evaluation of the suitability of the chair, desk, monitor/s, keyboard, mouse, phone, printed material positioning, foot area and lighting. Adjustment of the chair and position of desktop items (where this is possible). A workstation ergonomics checklist will be completed for your reference. Equipment recommendations will be supplied if needed. This service is suitable for anyone who has concerns relating to their workstation. This can include discomfort, pain or injury affecting the neck, shoulders, arms, wrists/hands, back, hips, knees or the need for a sit/stand workstation. Individual interview to ascertain the nature of the musculoskeletal issues or other concerns. Assessment of the suitability of the of workstation and identification of workstation factors contributing to the concerns, such as the adjustment or positioning of equipment, working postures, sitting habits and work behaviours. Other injury management recommendations, such as exercises, stretches and postural changes will be discussed. Workstation ergonomics checklist and injury management recommendations will be completed for your reference. Equipment recommendations will be supplied if needed. Because our assessment services are in high demand and we want to help as many people as we can, we cannot offer typed reports or after assessment liaison, such as phone calls or emails to managers etc as part of this service. Discounts for multiple assessments done on the same day. 25% for 4 or more. 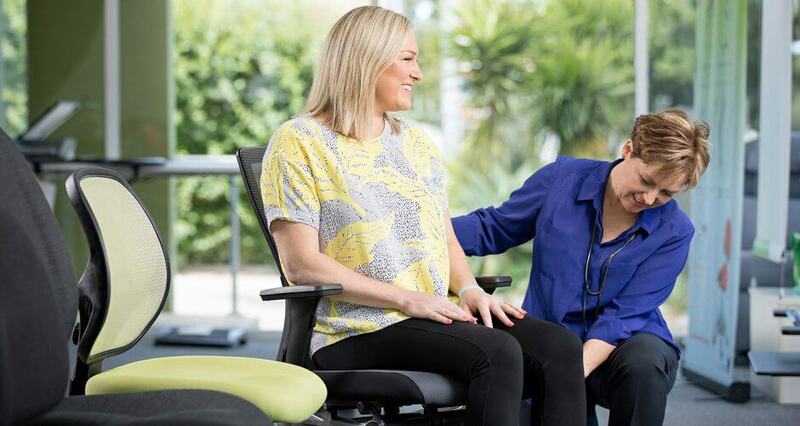 Our occupational therapist provides individual ergonomic chair/seating assessment at your workplace. In a Group Training session, employees learn how to set up their own workstation and chair correctly, discuss healthy work practices and discover tips on troubleshooting common musculoskeletal issues. To book an assessment, call our team on 08 8351 0666, contact us or come and see us at our showroom.